Gleim vs Wiley CPA (100+ hrs Research!) - Which is right for you? We put over 100 hours into distilling the marketing hype into facts. We went in and used all of the best CPA review courses. Then we asked another team to review our data independently. Here’s what we learned in our analysis of Gleim vs Wiley CPA. You can use this scorecard to perform your own analysis, too. You’ve probably seen one CPA review course touted as the best, only to see another listed at the top on a different website. You may also have realized that some websites make money by promoting the course providers that pay them the most. Dr. Gleim created the self-study CPA Exam Review industry over 40 years ago as an accounting professor who saw what it would take for his students to pass the CPA Exam. Today, we remain focused on what we believe is going to help you pass the CPA Exam best: strong course content, a superior test bank, truly adaptive technology, plus great coaching and support. The same passion guides us to help every single candidate who relies on us to pass the CPA Exam. So, it’s only natural that we want to equip you to make the right choice for your unique study needs. We’ve compared the features of all the best CPA Review courses side-by-side. Let’s look at Gleim vs Wiley CPA in more detail. You can use this chart for your own evaluation of course providers, too! 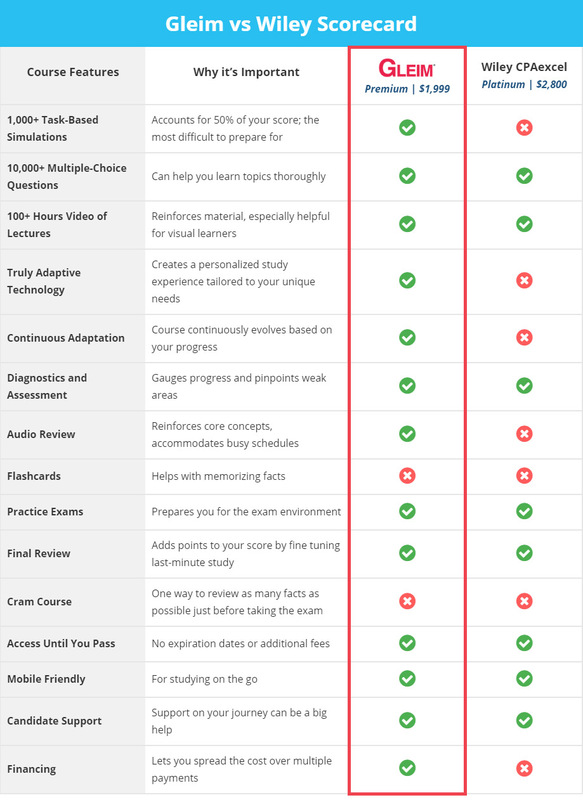 You can also see a detailed analysis comparing major CPA course providers in this comparison chart. Generally, providers update their exam prep materials every year. We made sure our researchers were looking at the latest versions of both Gleim and Wiley CPAexcel review courses. The best CPA review providers offer products at different price points. For example, many offer a CPA review package that doesn’t include certain components for a lower price. To keep it fair, we compared the premium systems – the ones you are most likely to consider when you’re serious about passing the CPA Exam. In this case, we compared Premium Gleim CPA Exam review materials to the Wiley CPAexcel Platinum package. First, we carefully read through Wiley CPA’s marketing materials to understand and document claims. Then, we had a second party go through the Wiley CPA course as a user. We updated our research to reflect the facts that became apparent. Next, we handed our research off to a separate quality control team to verify it all. 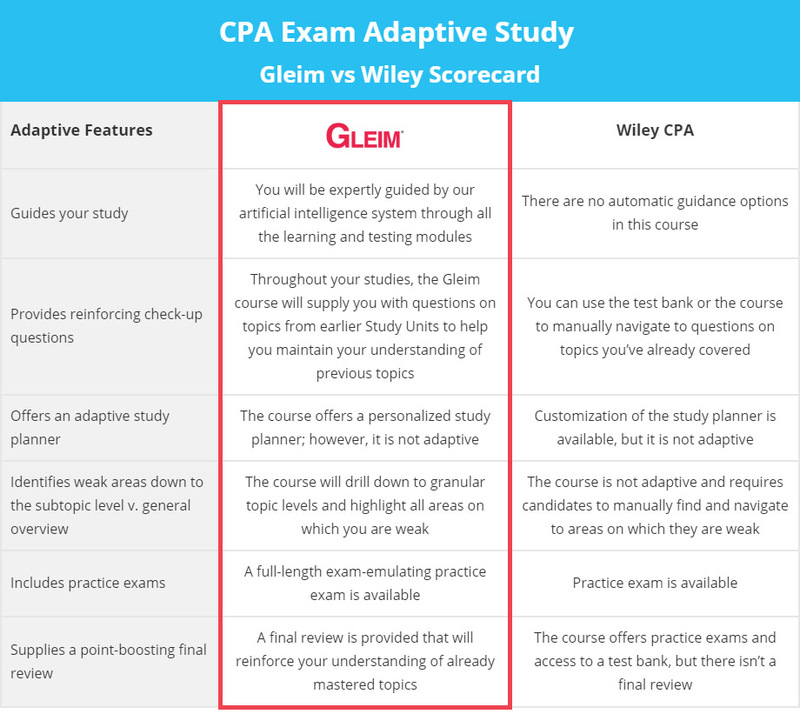 We put over 100 hours into comparing the best CPA review course providers, including Gleim vs Wiley CPA. Finally came the task of pulling it all together in a way that would be meaningful to you, the CPA candidate. After all, the whole point was to present what we hoped would be an unbiased, balanced analysis to help you weigh the options yourself. We identified 16 categories of features you’ll find in the best CPA Review courses. These categories formed the basis for our analysis. Which features are most important in a CPA Course Review? Some features will be more important than others. And some things that matter to you may be different from those that matter to the next person—to an extent. For over forty years, we have studied which elements in a course are the most critical to passing the CPA Exam. Without a doubt, the quality and quantity of your questions—both MCQs and TBSs—are the most critical variable in candidate success. Below we dig a little more into the review features and why each is important. We also included notes on how those particular features played out in our analysis of Gleim vs Wiley CPA. We encourage you to look at the results through your own lens. Task-based simulations (TBSs) test your ability to apply knowledge and judgment in practical situations. They are one of the most difficult parts of the CPA Exam to prepare for. In recent years, the exam has moved toward including more task-based simulations, which now make up 50% of your score on all sections except BEC. The more practice you can get, the better. The Gleim CPA Review includes many more TBSs than WileyCPAexcel. We used quantity as the factor here because it is an objective measure. The quality of TBSs is also important, and some CPA review courses provide a sample of their TBSs. The sheer number of questions in a test bank is important – as long as the questions are high quality. The CPA Exam can test on 229 topics that break down into roughly 600 representative tasks. No one knows what the actual questions will be – so you have to know it all. With a smaller test bank, you can run into repeated questions. You miss opportunities to learn material as thoroughly with fewer practice questions. With a large test bank, be wary of questions repeated with only the numbers changed. The best MCQ test bank will contain a lot of questions, and each question should teach you something new. This is the principle behind the test bank of MCQs in the Gleim CPA Review. Both of these CPA review course providers offer far more than any of the others, with the next closest amount of MCQs at 6,200. Wiley CPA has slightly more MCQs than Gleim, although Gleim’s MCQ test bank is widely recognized as a major factor in helping candidates pass the CPA Exam. Wiley CPA clocked in with 29% more hours of video lectures than Gleim. Taking practice exams gives you confidence that you know the material. It can also help you get familiar with the test format and functionality. Almost every CPA review course includes practice exams. However, not all look and function the same as those you’ll have on test day. Gleim and Wiley both offer two types of practice exams: full-length, exam-emulating exam rehearsals and unlimited customizable practice exams. While the practice exams can mirror the Prometric interface, only a full-length exam rehearsal will give you the complete exam-day experience. Gleim makes sure its practice test interface looks and works just like the one you’ll see at Prometric when you sit for the real CPA Exam. We’ve heard from many CPA candidates that they appreciated getting used to the calculator and timer in Gleim’s practice exams, for example, because they were just like those they had to use on test day. Make sure the provider you select offers multiple ways to experience the Prometric CPA Exam interface. In addition to practice exams and the exam rehearsal, Gleim offers a Final Review. The Final Review leverages adaptive technology to create a personalized study plan as you finish your exam preparation based on the results of your exam rehearsal, adaptive quizzes, and practice exams. This lets you build up any weak areas and boost your CPA Exam score. Because the Wiley system is not adaptive, it does not provide a Final Review option. I appreciated the many different ways Gleim let me tackle the information, whether it be reading from the test, video, presentation, audio, and plenty of multiple choice in formats that simulated the exam format or provided immediate feedback. No one goes into the CPA Exam expecting to fail, but the low pass rates show that many still do. With Access Until You Pass® from Gleim, you can continue to use the materials as long as you need to. Wiley CPA also offers their own version of this guarantee. Both providers include free updates to the study materials as they are released during the time you are using the review course. When comparing providers, always read the fine print. Some CPA review course providers may actually enforce limited time access to their products. If this time expires, you need to pay more to regain access. Self-study can be isolating. The best CPA review systems will include thorough support to help you get to the finish line. This can include phone, live chat, and email support to help keep you motivated, answer subject matter questions, and assist with any tech support questions when using study materials. Personal Counselors help you set a study plan, encourage you to stay on track, and guide you through your exam process—from registration to score reports. Wiley CPA does include support but it appears to be limited to professor mentoring, which lets you ask university professors topical questions. The [Gleim] Personal Counselors were always encouraging and helpful. Even when I felt despair throughout the process they never stopped believing in me. CPA Exam prep prices don’t always make much sense. The Gleim CPA Review course is among the least expensive but contains deeper features than the higher priced options. Some providers charge a higher price but offer deep discounts continually. And the highest priced option (Becker) only offers 18 months of access, requiring additional fees if you need more time. The reason Gleim always offers its products at such an affordable price is purely because we believe in making CPA review materials accessible to all. That has been a guiding principle from the start more than four decades go. Gleim offers incredible value for the budget-conscious student and costs 20% less than Wiley CPA, the next lowest-priced option. A truly adaptive system will serve you the content you need to focus on to improve your score automatically. Essentially, the adaptive nature results in a course that’s unique to you and continuously changes based on your progress learning the material. The Wiley CPAexcel review course requires you to manually select course sections and test bank questions as you study and practice. We could not see any area of the Wiley exam prep materials that offered an adaptive learning experience. It [Gleim] was so well developed that it didn’t feel like I was giving up my entire life just to study. Do you really need adaptive technology? Taking the CPA Exam is a big investment. You want to choose the study course that will give you the greatest advantage. But do you really need adaptive technology? Think of it this way. You’ll have one less thing to worry about if your CPA Exam Review picks out your study topics each session automatically. We all like to think we can pinpoint our weak and strong areas. But humans by nature like to focus on things we know and avoid those we don’t. Adaptive technology focuses you where you need to study–you don’t even have to think about it. If you have the chance to use a system that automatically tells you what you need to work on more, it’s a no-brainer. Just go ahead and remove that uncertainty. Adaptive technology in the Gleim CPA Review guides you to the material you need to study to improve your weak areas. AI takes the guesswork out and efficiently drills down to the topics you need to practice more, resulting in a course that’s uniquely crafted to your needs. Sure, it’s harder to focus on the things you don’t know yet. But it’s also more effective. In our breakdown of CPA course features, Gleim scores fourteen to Wiley’s eight out of sixteen. As you consider which CPA Exam prep course is the best fit for you, first identify the features that will set you up for success. Only you know your study style and needs – it’s important that you understand what you need first. Then you can use the list above to compare foundational features across providers, consider any additional must-haves, and finally look at the value.